If you answered no, I do not fault you, nor do I cast any judgments. 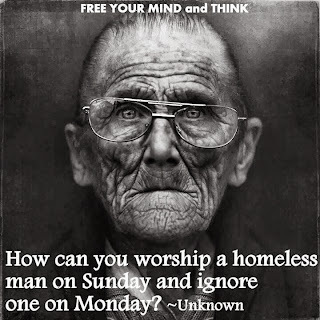 There seems to be a trend in modern Christendom that equates poverty and homelessness with curses and sin. 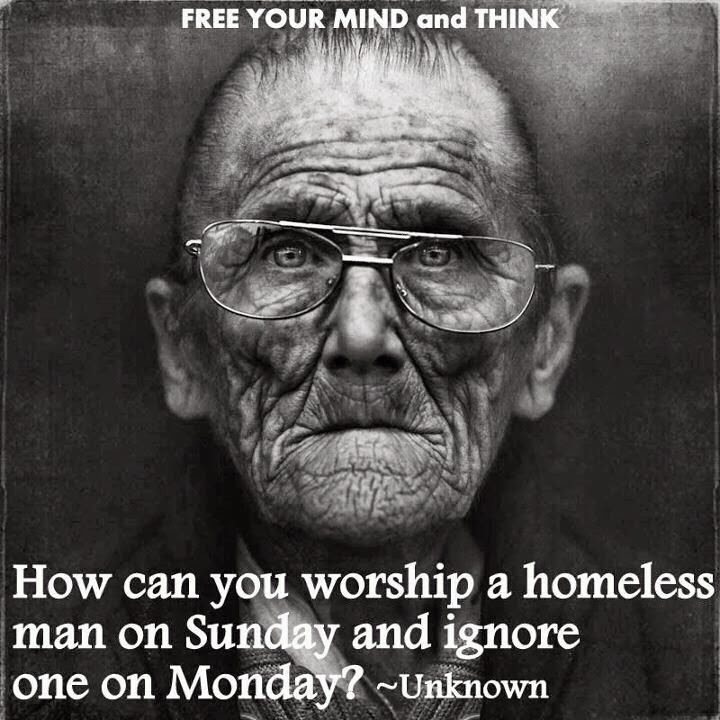 Thus, if are homeless you must have done something really awful to piss G*d off! Being that we are all sinners this cannot be the only reason Christians fail to help those in need. Of course there will always be some anxiety over letting a total stranger stay in your home regardless of his or her lot in life. In this age of fear and trembling (for all the wrong reasons), we must always be on guard from those trying to hurt us and take our neat stuff. What the hell would we do if one of these dirty smelly derelicts took our new 50+ inch flat screen TV!?! Our weekend would totally be ruined! Not to mention our week- The frigging Voice just started! I would also suggest a different kind of fear: a fear that one day we could actually be homeless and hungry ourselves. Lord forbid! This type of fear is even worse than the first- for this fear brings about apathy and a hardening of the heart towards those suffering and in need. This fear also causes an elitist mentality and a feeling of moral superiority (get a job you damn bums!). G*d help us if we ever reach this point. If everything we have is a gift from G*d, why are we so hell bent on protecting our materialistic things? If Jesus is the author and finisher of our faith, why do we not believe we will be protected if we come to the aid and need of another? Just a little something to think about; may the Holy Spirit be our eternal Guide. Would you let a homeless person stay at your house?